It’s almost Halloween and I haven’t shared any Halloween treats, so here is a fun idea for you to make with your kids. We make sugar cookies every year, but this year we went a little crazy and took our cookies up a notch. We had a blast decorating these! My 14 and 17-year old boys had as much fun as my 9-year old. They definitely let their imaginations run wild, maybe a little too wild on some of them. I just think they are so dang cute. Be creative, the possibilities for monster faces are endless. Have fun! Assorted candies for decorating , such as candy sprinkles, marshmallows, black licorice, red licorice ropes, runts, sweetarts, candy eyes, etc. NOTE: You could use any flavor cookie dough you want and if you would rather make homemade cookie dough, go for it. I just absolutely love the Betty Crocker Sugar cookie mix, they are so good and so fast and easy to make. I actually had someone ask me for my recipe when I took them some. The Pillsbury website I saw these on actually used peanut butter cookie dough, so use whatever you'd like. Heat oven to 350°F. In bowl of an electric mixer, combine sugar cookie mix, butter, egg and flour. Mix until well combined. Scoop out into balls about golf ball size. On lined cookie sheets, arrange 7 cookie dough balls in circle 3 inches apart and 2 inches from edge. Securely insert 1 craft stick into each ball, with end pointing toward center of cookie sheet. Repeat with another cookie sheet and remaining 7 cookie dough balls. (You may have a little dough leftover to make a couple more, so you can either bake a third cookie sheet or try and squeeze one more on the cookie sheets). Bake 12 to 15 minutes or edges barely begin to brown. Cool 2 minutes and remove from cookie sheets to cooling racks. Cool completely, about 30 minutes. While cookies are cooling, if using your own buttercream, go ahead and get it made and then divide the frosting among 4 bowls. Add food coloring to frosting in bowls to make desired colors. 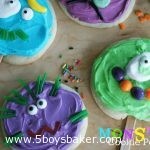 Frost cookie pops; decorate with icing and candies as desired to form monster faces. Those are so stinking awesome! !